Discover a conspiracy that threatens to set the Calixis Sector ablaze! A decadent noble uncovers a heretical artefact of dark origins. This crime sends the Inquisition on an investigation from his palace to a lost fortress on a distant world. Can you solve the mysteries of the Haematite Cathedral? Ths book is the first chapter of an epic trilogy of Dark Heresy adventures. The acolytes must solve the riddle of the Black Sepulchre to uncover a truth so dark the Calixis Sector may never recover from its discovery. Ths adventure takes the Acolytes from the spires of Hive Sibellus to the twilight coastlines of Baraspine. Can the Acolytes survive the siren's call of the twisted Dei-Phage? Designed for all levels of play, beginners and veterans alike can explore many different paths to success. Suitable for characters of all ranks. 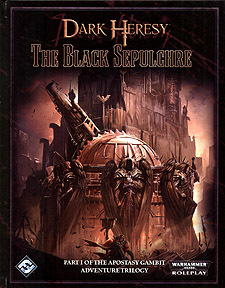 A copy of the Dark Heresy Core Rulebook is needed to use this adventure supplement.